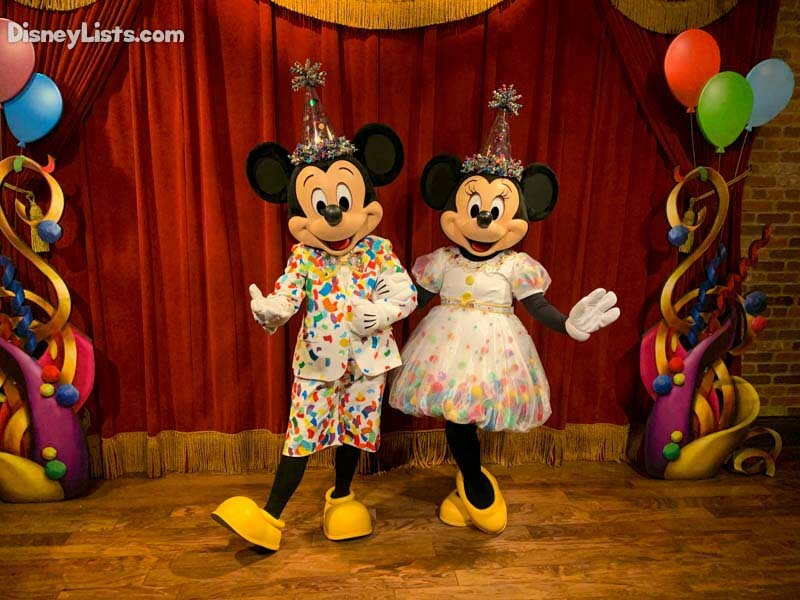 In November of 2018, Mickey and Minnie celebrated their 90thBirthday. 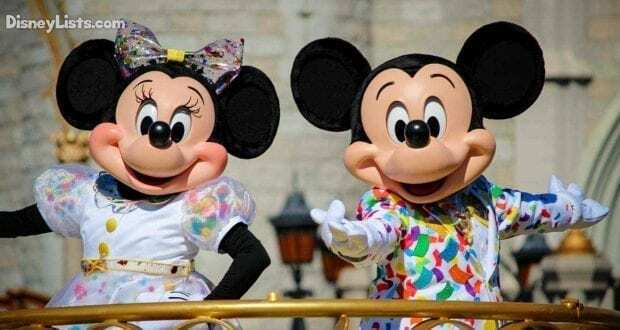 To mark this momentous occasion, now through September 30, 2019, you can enjoy Mickey and Minnie’s Surprise Celebration at Magic Kingdom Park. There are so many fun things to experience during this event. Catch all the details below. Your first stop in Magic Kingdom should be Town Square Theater where you’ll find the Celebration Station. Here you can add your name and where you live to Mickey and Minnie’s Celebration Guest Book. You’ll then receive a “You’re Invited” card which gives the top 10 ways to celebrate Mickey and Minnie, and it includes some cute stickers as well (see photo below). 2 – Meet Mickey and Minnie Together! Mickey and Minnie are back together again in the Magic Kingdom Park for a meet & greet with their special birthday party guests (that’s you). The old meeting area for Mickey has been updated for Mickey’s birthday celebration, and Minnie has joined him. They appear in new party outfits and birthday hats. They are adorable! This is must-do if you are visiting during the celebration! The wait times for this have been long. We’ve seen the waits hover around an hour. Thankfully, a FastPass for this meet & greet is available. If you can get a FastPass for this, we recommend doing so. Otherwise, keep an eye on the wait times during the day using the My Disney Experience App. 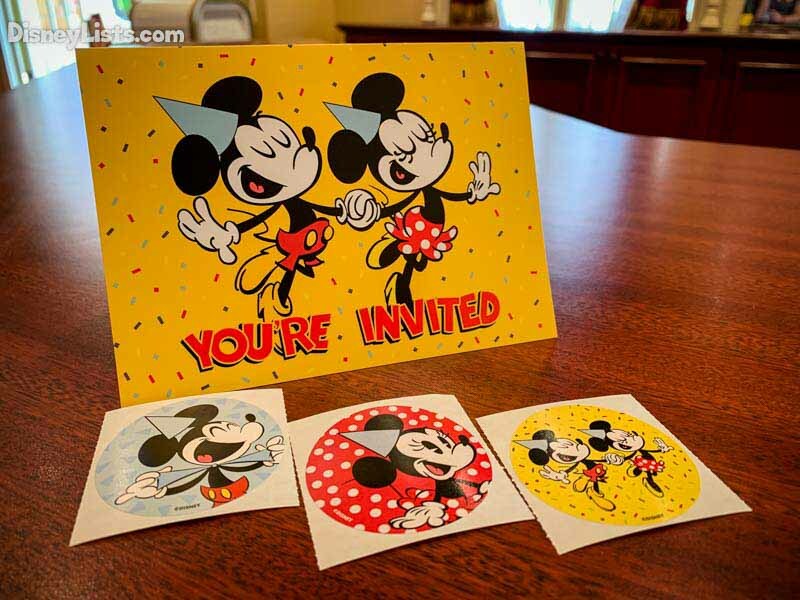 There is a brand new limited-time street party that celebrates Mickey and Minnie. The street party makes its way down Main Street, USA, led by live-singing hosts. 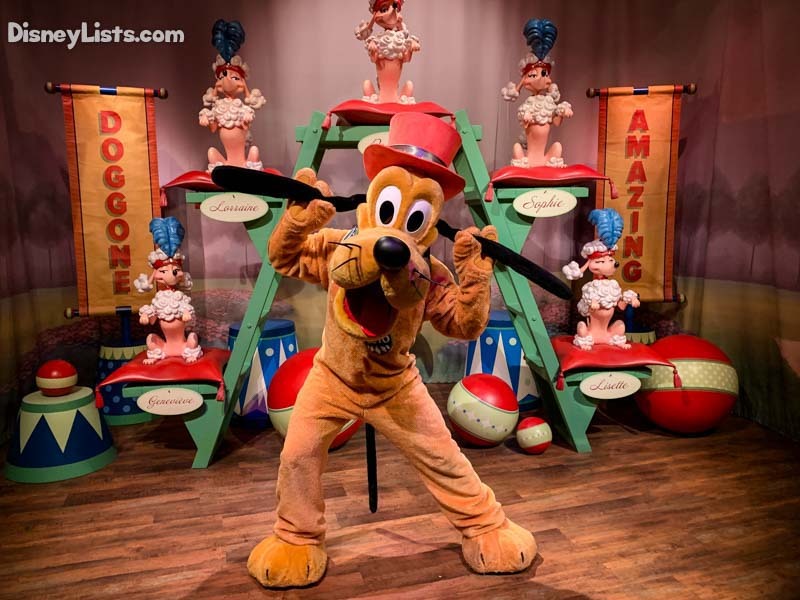 Following along are five different floats featuring your favorite Disney pals: Donald and Panchito Pistoles, Clarabelle Cow and Clarice, Mickey and Minnie, Daisy Duck and Dale, and finally, Goofy and Max. The show lasts around 35 minutes and has a lot of upbeat singing and dancing. Mickey and Minnie also sing to each other, which is really cute! The best spot to catch this is the area near the Partners statue in the Hub. Here you’ll get a great view of all of the floats. Also, Mickey and Minnie will stop right in front of Cinderella Castle. Currently, this street party is being offered three times a day. Be sure to check the Times Guide for the most up to date information on when this party occurs! You don’t want to miss it! Click here to see a video of some of the party on from our Instagram page. As part of the celebration, Disney is also promising some “extra magic.” So far, this “extra magic” includes special meet & greets of rare characters near the flagpole on Main Street USA. The first day we saw Judy and Nick from Zootopia, and then we saw Chicken Little and Abby Mallard. We expect more rare characters to rotate as the celebration continues. You never know who will show up, so be sure to check back throughout the day for these unique characters! When visiting, check the Times Guide for the “Disney Friends visit Town Square” for the specific times the characters will be greeting guests that day. Before the celebration, Minnie was greeting guests at Pete’s Silly Sideshow. However, now that she has moved to Town Square Theater with Mickey, there is a spot for a new character greeting at the Big Top. Pluto has joined the line-up in this area. You can meet him now after meeting Daisy. He is wearing a cute top hat for his circus outfit. Goofy and Donald are still there in a separate line. With any good celebration, there are specialty food, beverage, and merchandise options available during the party. 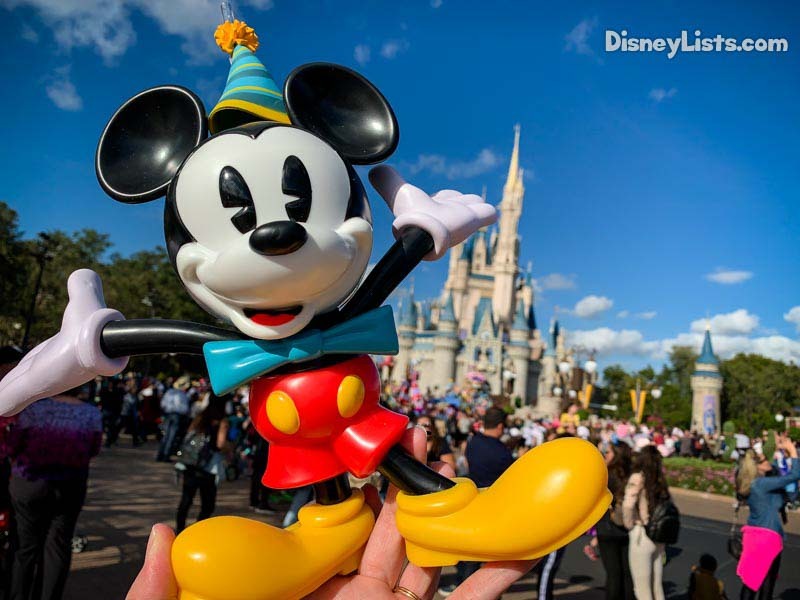 Throughout the year, Disney will offer a rotating array of items for the celebration. Mickey Burger at Cosmic Ray’s Starlight Café. Angus burger with macaroni and cheese, American cheese, cheese sauce, flaming hot cheese dust, and bacon served on a Mickey Mouse bun. Minnie Kitchen Sink at the Plaza Ice Cream Parlor. The novelty item comes filled with two hand-scoops of ice cream topped with whipped cream, cherries, and your choice of hot fudge, peanut butter, or caramel. Now and Forever Slush at Gaston’s Tavern in Fantasyland. A sparkling cider slush served in a Champagne flute and garnished with a white chocolate-dipped strawberry featuring Mickey and Minnie. This tasty treat will be available through the end of February. True Love Cheesecake at The Crystal Palace, Jungle Navigation Co. LTD Skipper Canteen, and Tony’s Town Square Restaurant. Strawberry-vanilla marble cheesecake comes with raspberry purée, whipped cream, and a Mickey and Minnie chocolate piece available through February 15. Celebration merchandise is also available in Magic Kingdom. The largest selection can be found at The Emporium. You’ll find a variety of shirts and sweatshirts for adults and children, as well as tumblers and mugs, key chains, bags, and hats. Mickey and Minnie’s Surprise Celebration is a nice addition to the park. Its limited nature will likely draw even more people to this popular park. The meet & greet with Mickey and Minnie was my favorite part because they are so cute together, and their outfits are so fun. If you get a chance to get to Magic Kingdom before September 30, be sure to take some time to enjoy this fun celebration. 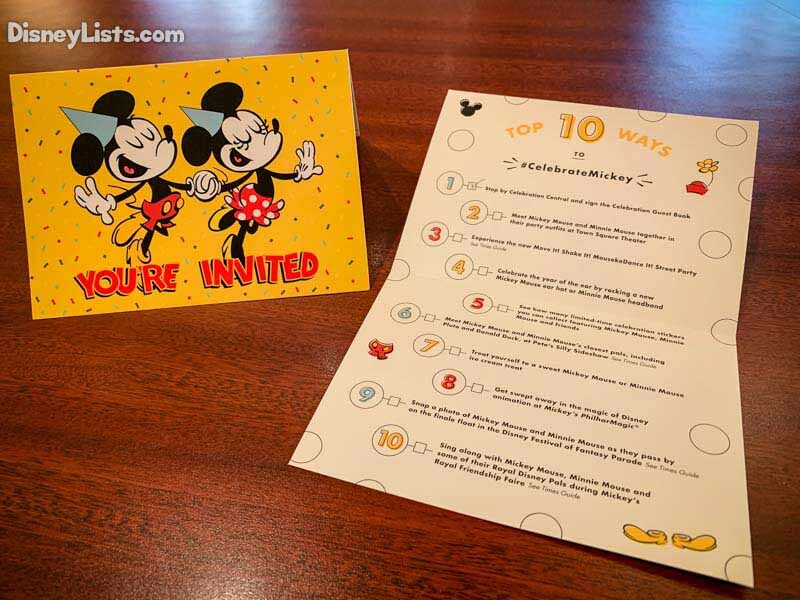 Editor’s Note: The Disney Company provided us with a complimentary Magic Kingdom Park day ticket to enjoy the Celebration events. However, as always, the thoughts and opinions contained in this article are entirely our own.